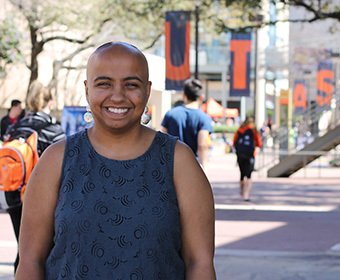 Sanah Jivani is the second UTSA student named a Truman Scholar in school history. (April 23, 2018) – Sanah Jivani, a UTSA Honors College student majoring in sociology and communication, has been named a 2018 Truman Scholar. Jivani is just the second UTSA student in school history to earn the prestigious honor, which was awarded to only 59 college students out of more than 750 nominations. She is also the only student from Texas who will receive the scholarship this year. The competitive scholarship, awarded annually since 1977, supports aspiring public service leaders in the United States. The Houston area native and first-generation student credits her family, friends and mentors for giving her the self-confidence to succeed. In the seventh grade, Jivani lost all of her hair due to a medical condition called alopecia, which she developed as a toddler. As a result, she says she struggled with wigs, self-hatred and self-harm. Jivani eventually realized the best way to overcome her own challenges was by helping others. That’s when she founded The Love Your Natural Self Foundation, a nonprofit dedicated to improving self-esteem and empowering others to be the best version of themselves. So far, the foundation has raised more than $30,000 to provide free curriculum to schools to educate students on how to practice self-love and self-acceptance. After Jivani graduates from UTSA in May 2019, she plans to enroll in a graduate-level non-profit management program to gain the knowledge and skills to run her organization full-time. As a Truman Scholar, Jivani will receive up to $30,000 to support her graduate studies. She will also receive priority admission and supplemental financial aid at selected graduate institutions as well as leadership training, career and graduate school counseling, and special internship opportunities within the federal government. Learn more about the Truman Scholarship including a list of the 2018 Truman Scholars. Learn more about the UTSA Office of Scholar Development or visit the office in the McKinney Humanities Building (MH 4.02.26).